Neo-Babylonian Empire ceased to exist in 539 BC, while its territory was incorporated into the Persian Empire under Achaemenid Dynasty founded by Cyrus the Great (also known as Cyrus II of Persia) in 550 BC when he decisively defeated the King Astyages (585-550 BC) of Media. Both Media and Neo-Babylonian Empire became an Achaemenid crown lands and history of Mesopotamia between 550⁄539 BC and 330 BC is referred either as the Achaemenid Period or Persian Empire. Persian conquest of Babylonia took place very peaceful. Babylonians did not offer any resistance probably because of internal difficulties and Persian tolerance towards other religions and peoples. In contrary to traditional practice in Mesopotamia, the Persians did not massively enslaved or deported the defeated peoples nor destroyed conquered cities. Subdued peoples were allowed to worship their own gods and kept their cultural autonomy. There are no reports about rebellion in Babylonia during the reigns of Cyrus the Great (559-530 BC) and his son and successor Cambyses (529-522 BC), while Darius I (522-486 BC) had to put down two Babylonian rebellions. 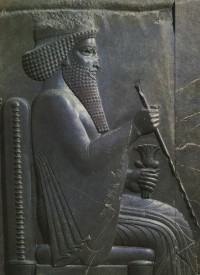 Darius I was also faced with rebellions in other lands and he decided for administrative reform of Persian Empire. The Persian Empire was divided into 20 satrapies governed by satraps supervised by king’s representatives who were “the king’s eyes and ears”. Thus Babylonia became a satrapy governed by a satrap with residence in the city of Babylon. Persian Empire reached its height during the reign of Darius I. He extended the Persian borders to the Indus River on the east to Aegean Sea and Egypt on the west. At the end of his reign he led a punitive expedition against the Greeks because of their support to the Ionian revolt but Darius I was decisively defeated at the Battle of Marathon in 490 BC. His son and successor Xerxes I (486-465 BC) also led military campaign against the Greek city-states but he was severely defeated at the Battle of Thermopylae in August 480 BC and at the Battle of Salamis in the Saronic Gulf near Athens one month later. After Xerxes’ defeat against the Greek city-states the power of Persian Empire under Achaemenid Dynasty began to decline. The Greek-Persian struggles continued also under Xerxes’ successors until the last Achaemenid emperor of Persia, Darius III (380-330 BC) was decisively defeated by Alexander the Great who conquered the entire Persian Empire.